What Makes a Present-Day Coin Valuable? Rarity: If a coin that is otherwise in demand is also rare, that scarcity of supply will drive up its price. Perhaps only a few examples of that coin were ever made, such as the 1943 copper wheat penny, of which only 40 were struck. Perhaps there were once many examples of that coin in circulation, but they’ve been removed due to wear and damage. Many valuable modern coins are actually the result of mistakes in minting that produce unintended effects on a small subset of a particular coin, such as the 2005 “In God We Rust” Kansas state quarter. Whatever the reason, when there aren’t enough for every collector who might like a particular coin, prices climb. 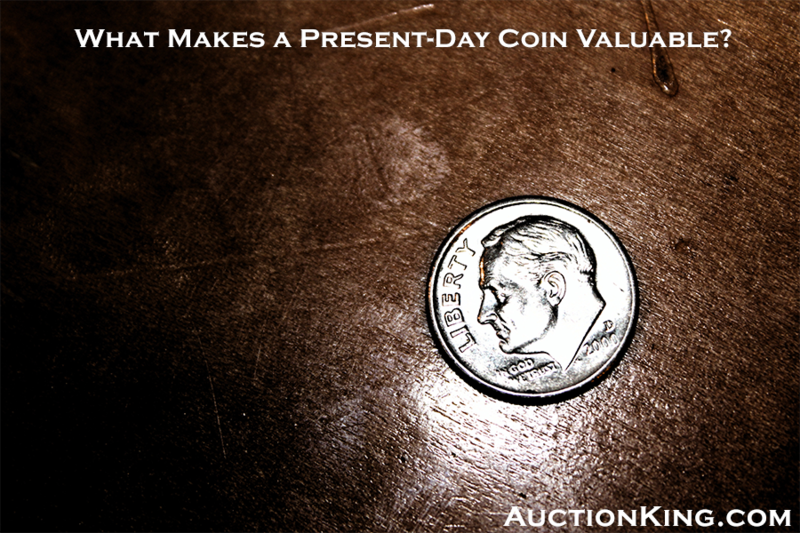 Condition: A coin that has been in circulation for a long time accumulates abrasions from use. Although this type of wear is expected, the worse the condition of a coin, the lower its value. The ideal state for a collectible coin to be in is uncirculated, which means it was never put into the regular money supply. Such a coin may have nicks or flaws from the production process, but as long as it exhibits a uniform, undamaged luster across all of its surfaces, it is considered uncirculated. Demand: As with any other type of collectible, the tastes of collectors can raise or lower the price of a particular coin based on what is of interest in the market. Certain types of coins, such as Lincoln pennies or the 50 States quarter series, are quite popular with collectors, which means that there are more interested parties out there vying for available coins. Because this is such a subjective factor, you should probably not try to anticipate demand—rather, collect the coins that are interesting to you, because it is likely that at some point tastes will change and values will shift. Meltdown Value: Coins made of highly valuable metals such as silver, gold, or platinum will appraise for more than coins made of base metal alloys due to the inherent value of their materials. While some ordinary U.S. coins were once made of valuable metals, nowadays only bullion or collector’s coins are minted from precious metals. At AuctionKing.com, we search the world for high-quality collectibles, artwork, fine jewelry and more to bring to our clients. Every item is triple-checked for authenticity so that you can bid with confidence using our secure proprietary bidding platform. Our selection is continually updated with our latest finds, with bids starting as low as $1. Register for a free online account today to find your next treasure.